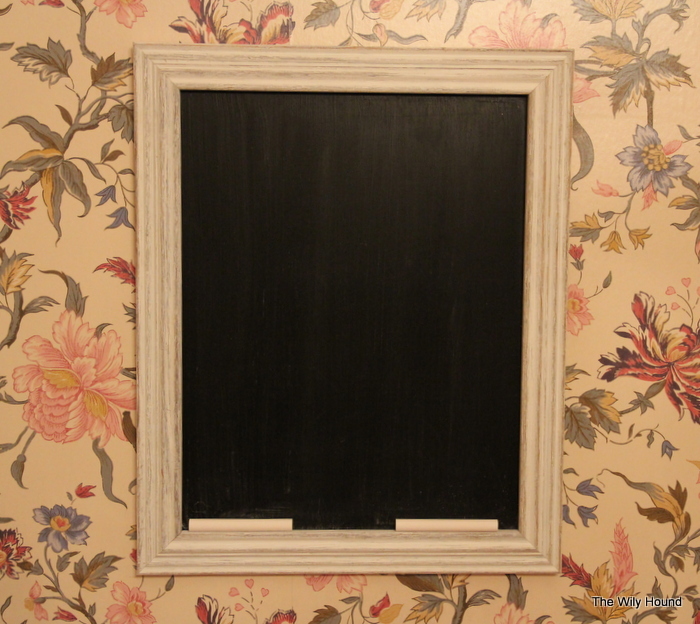 I was cruising through a fancy pants stationary store recently and spotted an adorable chalk board in an elaborate frame. My dreams of hanging it in our kitchen and jotting our (nonexistent) weekly menu or shopping list were dashed when I noticed the price tag: $40. $40?! Get the heck outta town. True to form, I scoffed and left the store muttering to myself about highway robbery and the nerve of trendy stationary store snobbery. 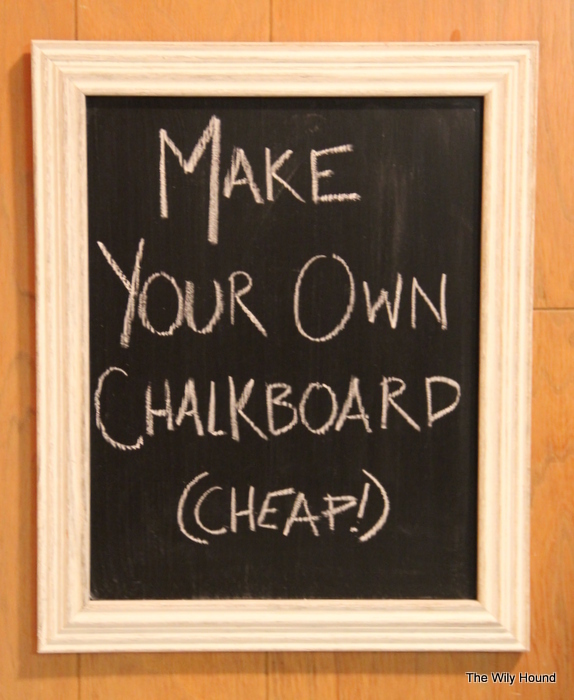 Homemade chalk boards are all over Pinterest so I decided to give it a shot myself. I found one that met all of those criteria at TJ Maxx this past weekend. 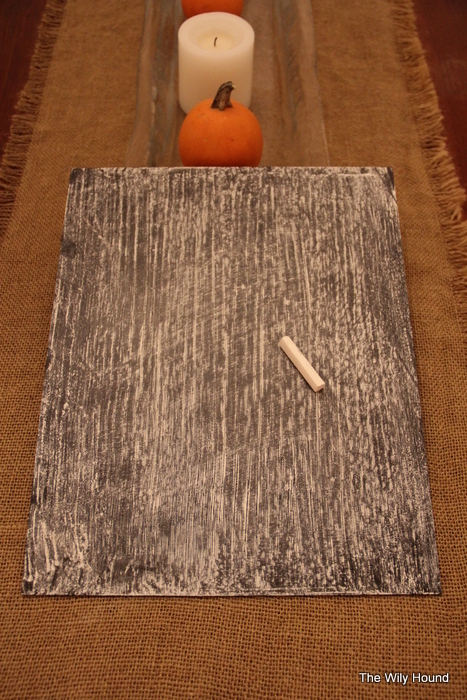 I liked the weathered look of the wood and thought that it would look really nice next to the black chalkboard paint and bright white chalk. I popped the glass out of the frame and got to work painting it. 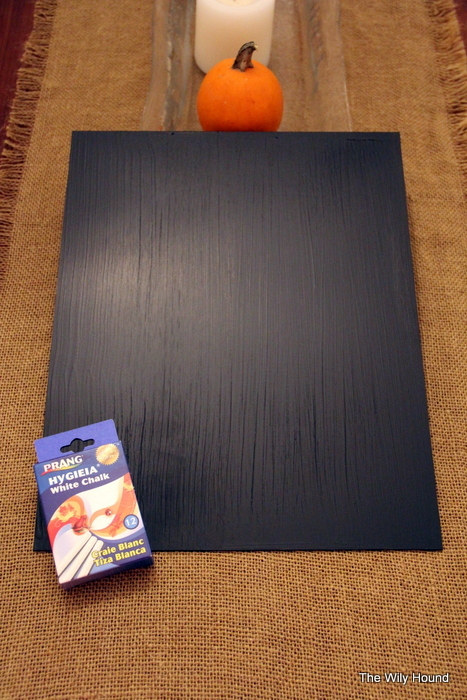 I would probably recommend using a paint roller for a smooth finish, but all I had was a brush and I didn’t feel like trekking over to Home Depot, so a brush it was! I was nervous at first that the glass would be too slick and the paint wouldn’t stick, but it worked out fine – it just needed a few extra coats. 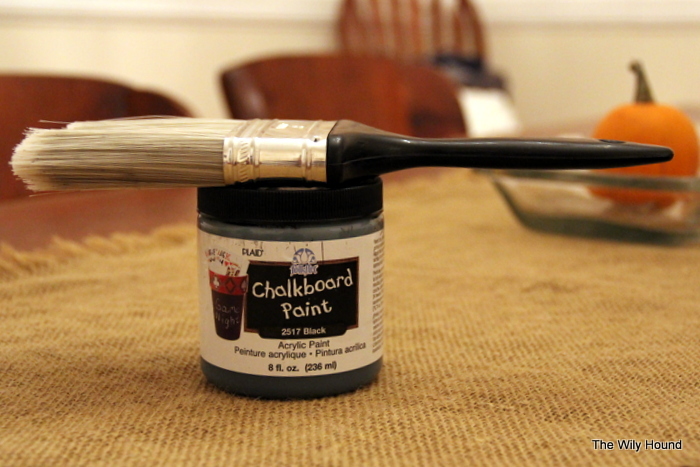 When all was said and done, it probably needed about 5 coats of the chalkboard paint, but you might find that you need less if you use a roller. Once the painting was done, I let it cure for 24 hours (as stated on the chalkboard paint directions) and then ran the side of a piece of chalk over the whole thing and erased it to condition the surface (apparently this leaves a coat of chalk dust that makes for the best erasability in the long run). I popped the glass back in the frame and voila! 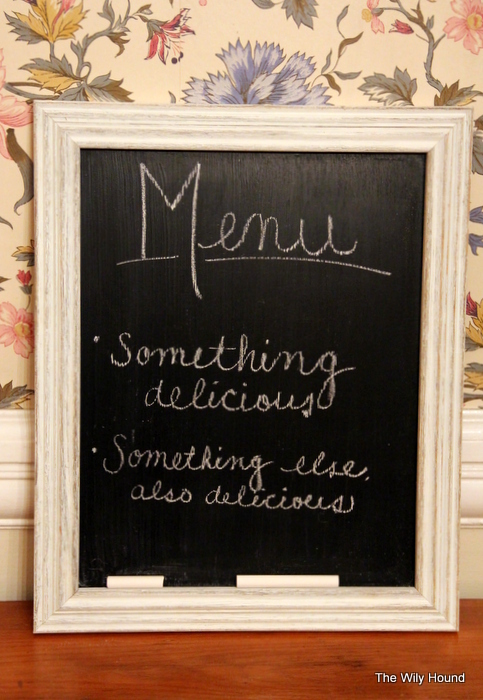 A charming homemade chalkboard. 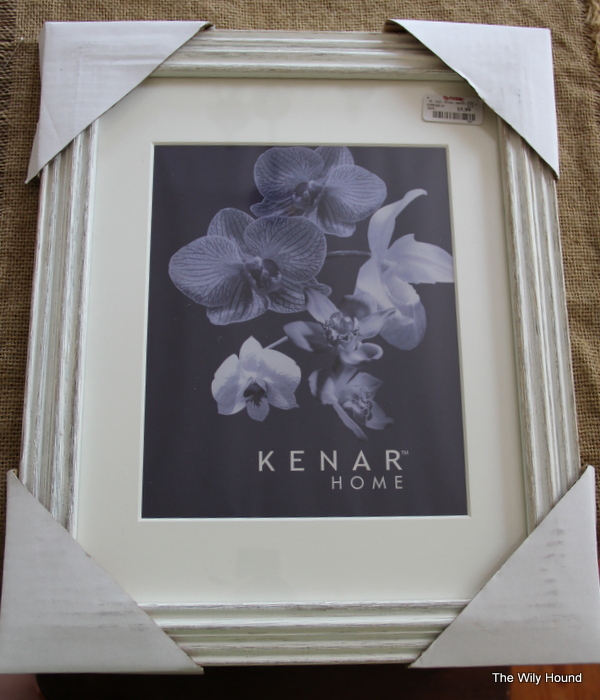 The whole project set me back $18.44 plus tax ($9.99 for the frame, $7.25 for the paint, and $1.20 for the chalk) and since I have leftover paint, I’m trying to figure out what to chalkboardify next. A storage container? Brody’s food bowl? Justin’s car? The possibilities are endless. I’ll keep you updated. Edited to add: I jazzed up a couple of IKEA storage jars using the leftover paint…read more here! Justin’s car sounds like a great idea. Make sure to leave chalk and string just in case any passer-by wants to write great words of wisdom! Ooh great call! I bet all of the messages would be really sweet and supportive, especially with the way he drives! Thank you! I was looking for a DIY post! to clarify, you painted the glass with the chalkboard paint? Yes, directly on the glass. 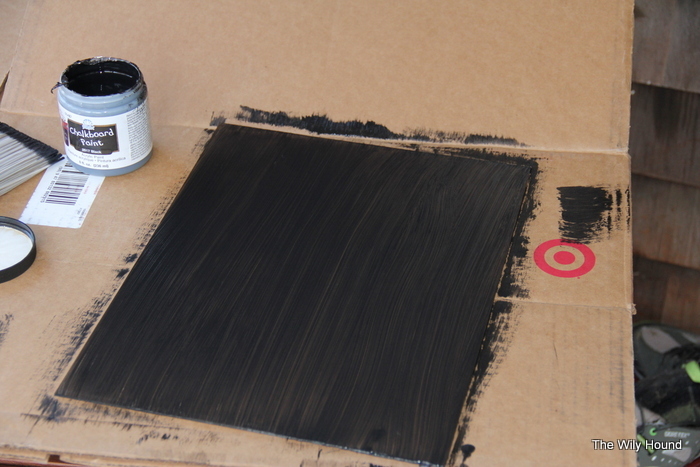 How long do you wait for the paint to dry before starting the next coat?